After years as a journalist, I’m a fan of deadlines. I love the feeling of accomplishment that comes with finishing a task on time. Having a baby is the firmest kind of deadline — your newborn is coming no matter what. So in the months before my first baby was born, I used that impending deadline as motivation, to focus on what really needed to be done and make it happen, both at work and at home. Except I made a crucial mistake. I set my deadline at the baby’s due date… and my water broke three weeks early. When I called my sister to let her know, she was getting ready for bed and answered the phone in a drowsy voice. “Are you in labor?” she asked dryly, implying playfully that 1) there wasn’t any other reason I should be calling calling that late and 2) I couldn’t possibly be in labor already. Our doula advised me to stay at home through the night so I could be as comfortable as possible and head to the hospital in the morning when my contractions were closer together. Following her advice, I climbed into bed to rest. But as any woman who has gone through labor will tell you, sleep doesn’t come easy when you have pain in your abdomen every few minutes. So while my husband caught a few hours of shut eye, I crept downstairs, opened my laptop at our kitchen table, and began forwarding emails. One of the rare times I got dressed during maternity leave. My company, Socialexis, had been acquired just two months earlier, and we were in the midst of transitioning my team in-house at The Penny Hoarder, where I was responsible for overseeing and growing the editorial side of the company. Emailing your colleagues during active labor might sound crazy, but the truth is, it was a welcome distraction from what was going on in my uterus. And I knew it would give me peace of mind in the coming days, mental space to focus on my baby instead of my inbox. By the next afternoon, I was a mom. I’ve blogged about the acquisition and why I decided to join The Penny Hoarder as an employee after years of growing my own business. But until now, I haven’t shared much about what it was like to have a baby at the same time. While writing about careers and entrepreneurship comes easy, sharing the highs and lows of motherhood in a way that’s helpful to others requires peeling back conflicting layers of joy and resentment, gratitude and guilt. For me, these words are harder to get on the page. Here’s a glimpse into what it was like to make this transition as a new mom. How parents — and particularly new moms — juggle work and babies is an important topic, and it’s one we don’t often discuss in the startup space. Startups tend to be full of ambitious and childless 20-somethings who are eager to put in long hours when they need to; I know because I was one of them. But successful startups eventually grow up, either by hiring employees with more experience or existing long enough that their employees enter new stages of life. While family-friendly policies might initially seem unnecessary, at some point leadership will be forced to have those conversations. I bet The Penny Hoarder founder Kyle Taylor didn’t expect to flesh out a maternity policy quite as early as we did. He broached the idea of acqui-hiring my company before I knew I was pregnant, and most of our conversations took place via Google Hangout, so he wouldn’t have noticed my bump anyhow. It wasn’t until we were hashing out details of the agreement that I was far enough along to let him know I was expecting a baby. He was a 28-year-old guy, not the demographic you’d expect to be particularly sensitive to the needs of a pregnant woman. Yet he handled those conversations graciously and professionally, which was one of the many reasons I knew it was a good choice to commit to working with him. Our founder has provided me tremendous freedom and autonomy in my role, which in turn has allowed me to figure out how to balance my family and my job. As a result, I’ve truly been able to give the company my all. Since joining forces nearly two years ago, we’ve grown The Penny Hoarder exponentially; we finished 2016 with 55 employees, $20 million in revenue and a spot on the Inc. 500 as the fastest-growing private media company in the U.S. 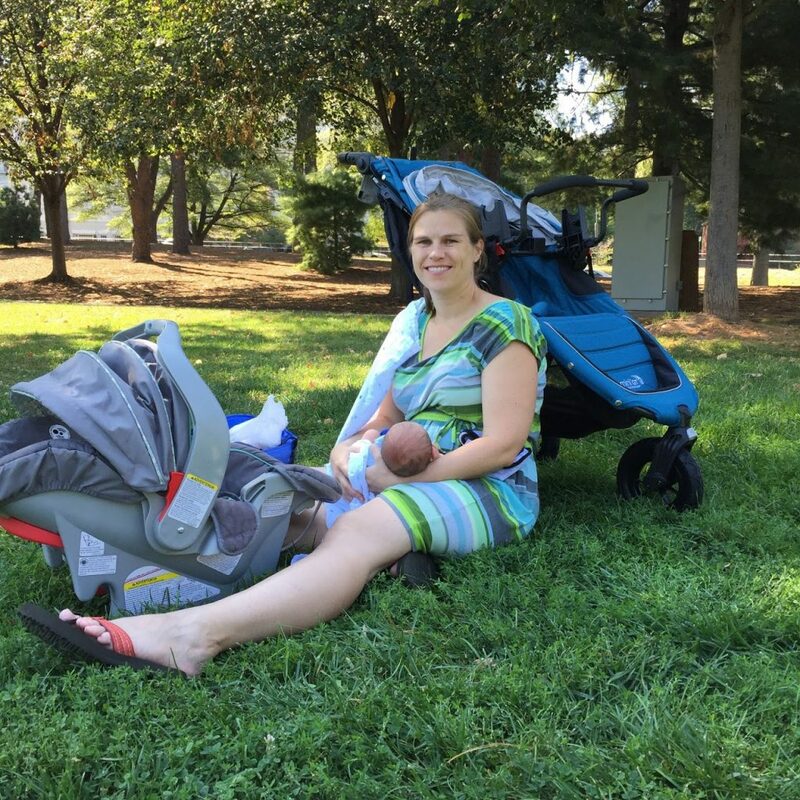 This isn’t the most flattering photo, but it’s real: the first time we went on a walk with the new baby. 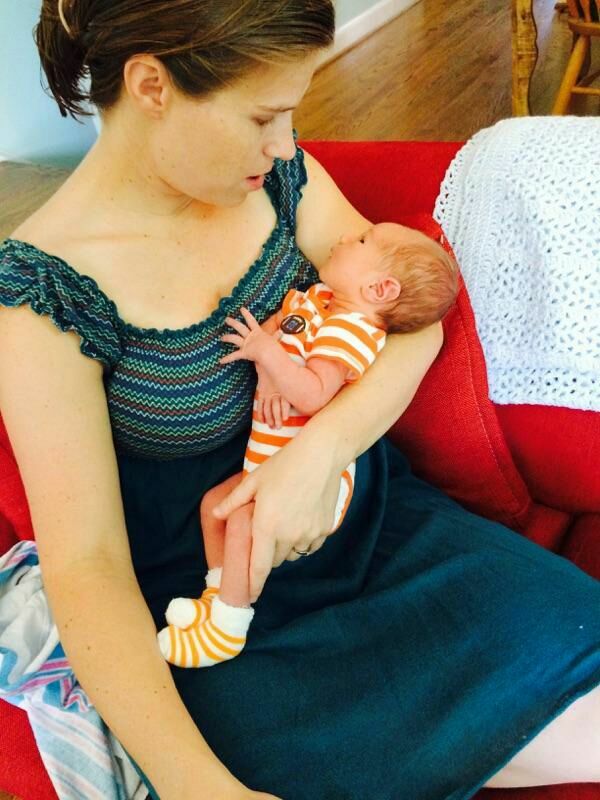 I returned to work eight weeks after giving birth to our son. While I was excited to dig back in — I had some serious FOMO because the startup had grown so much in just two months — it also felt too soon. I was physically healed but incredibly sleep deprived. I felt like I’d only just crossed the threshold of figuring out how to take care of a newborn and was about to enter the stage of enjoying him… and then it was over. Thankfully, I worked from home. My husband and I hosted a nanny share at our house so we could see the baby throughout the day. I am so grateful that I could work just feet from my baby in the early months; so many working parents don’t have that option. We live outside Washington, D.C., and the company is based in St. Petersburg, Florida. (My family didn’t move immediately because I was pregnant — we’re moving there this summer!) So I traveled frequently to our HQ to work with the team in person. For the first few trips, I brought the baby and husband/grandparent(s) with me. 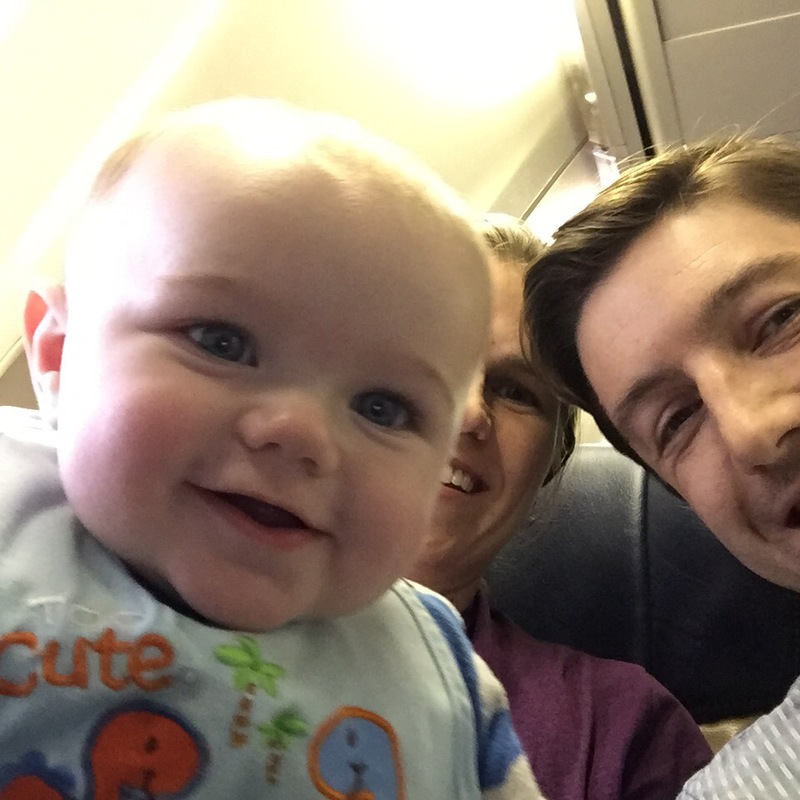 Family selfie during a plane ride when D was six months old. And what about breastfeeding? Any woman who has experienced the commitment of feeding a child from your own body is wondering whether I managed to do that while working full time. One of the reasons I’d wanted to host the nanny share at our home was because I had grand visions of breastfeeding the baby during quick breaks throughout the day. I didn’t come up with this idea on my own — I had a friend who worked from home and made this work for her, so I knew it was possible. Boy, was I off-base with that expectation. Our baby had a tongue tie that went undiagnosed until he was 12 weeks old, which means he wasn’t able to nurse efficiently. Here’s how you counter that as a mom who wants to breastfeed: You nurse your baby for half an hour, follow that by pumping, then feed your baby what you pumped through a bottle. The process takes up to 1.5 hours, after which you clean your pump parts… and for a baby under three months old, start the process again an hour or so later. It might be difficult to imagine how time-consuming this is, but let’s just say it was not conducive to getting work done. When we talk about pumping, we tend to think of it as a 30-minute exercise (and god-willing, that will happen for me with my next baby), but even when I dropped the nursing part and just did the pump at my desk while typing on my laptop, it took me nearly an hour to get enough milk to feed my baby. This was partly because women’s bodies often respond less effectively to a machine than a baby — who would’ve guessed?! — and partly because my body was making less milk than it should have since my baby hadn’t been efficiently removing it. We got our son’s tongue tie “corrected” a few weeks after I went back to work, but by that point, I wasn’t around my baby enough to help him re-learn how to breastfeed. I gave up pumping at four months and stopped breastfeeding entirely at six months, which was embarrassingly short of the year-long goal I’d set for myself. I felt like a failure, knowing I’d chosen to work instead of feeding my baby. I met women in my mother’s group who were approaching a year of pumping at work, and I simultaneously admired their dedication and hated them for it. So many women seemed able to combine work with breastfeeding, but I couldn’t get it to work for me and my baby. If you’re not a mother or don’t have hopes of becoming one, what I just shared is probably more than you ever wanted to know about breastfeeding. It’s also just one woman’s story. But while it might sound unique or unusual, the truth is, every baby and new mother has some trouble spots that force them to deviate from their plan. If it’s not a tongue tie, it might be difficulties with sleep or taking a bottle. And plenty of babies (and new moms, too) have more serious health conditions that require far more attention. In that way, I think my experience was pretty normal. Except most women don’t have as much flexibility at work as I do. They don’t work for companies with amazing benefits and a supportive boss. They don’t have the financial means to hire the help they need; some don’t even have the support of a spouse. No matter how challenging I’ve found juggling a demanding job and a family, it is way more difficult for most women. So what can you do if you find yourself pregnant while working? Ask for what you need — in a way that shows your employer how much they’ll benefit from you being set up to do your best work. Here’s the Plan: Your Practical, Tactical Guide to Advancing Your Career During Pregnancy and Parenthood, a book by entrepreneur Allyson Downey, is an excellent resource for identifying your options and figuring out how to talk to your supervisor about them. Join groups of working mothers to learn how others manage; both in-person and digital groups can be helpful. One of my favorites is a Facebook group called Startup Pregnant. And if you’re one of those ambitious 20-somethings who thinks you might want to have kids down the line, set yourself up NOW to be well-positioned when that time comes. That might mean launching your own business, so you have complete flexibility over your schedule. Or it might mean building your skills and network so you’re highly valued by the time you want to ask for flexibility, and your company knows you’ll continue to do great work regardless of your schedule. In addition to earning street cred, boost your earning power early on, so you’ve got that in place by the time you’re ready to have kids. I realize this is easier said than done, but it will be that much harder once you have kids. And considering only 13 percent of Americans get paid leave from their employer, you might need to fund your time off from your own pocket. I tend to look at the bright side of most situations — I consider myself an optimist. But when I talk or write about being a working mom, I sometimes find myself focusing on the hard parts. While becoming a mother is one of the best things that has ever happened to me, it’s also been one of the most challenging. Reconciling my new identity as a mom with my old sense of self — much of which was based on my career — hasn’t been an easy transition. Yet it’s worth it, and more so with every passing day. Just yesterday my husband and I were marveling at how much we’re enjoying the toddler phase: watching our son discover the world, learn new words and develop his own unique personality. And we can’t wait to see how our little boy takes to becoming a big brother. We’re expecting baby No. 2 any day! I suspect this time around will be a different experience for a lot of reasons. Not only will this baby bring its own quirks and personality, but my husband and I will be experienced parents with at least some knowledge of how to care for a small human. My work setup will be different, too. After this maternity leave, I won’t work from my home office. Instead, I’ll be based at our company’s brand-new space in St. Petersburg, Florida, complete with a lactation room designed with input from myself and a pregnant colleague. With this baby, I refused to make the same mistake I made with the first: I was ready at the 37-week mark. The car seat’s installed, my email autoresponder is drafted, work projects are delegated, and I’ve rested as much as I can to prepare for the marathon of birth. And yet here I am beyond his due date, without a baby in sight. Turns out this little guy isn’t as into deadlines as his mommy. Congratulations Lexi! I’m thrilled for you and wish you joy, a great, safe, and soon delivery, and as much sleep as possible. 🙂 Thanks for sharing your journey wise words with us. Congratulations! You do great work and are inspiring many! Never feel like a failure if breastfeeding doesn’t work out. For various medical reasons my wife couldn’t breastfeed… our son is graduating high school next week, top honors, all kinds of awards, 1 year of college credits already complete, etc. I think it’s good to encourage breastfeeding, but the shaming of mothers who can’t or otherwise choose not to is detrimental all around. I was also lucky enough to mostly work from with my company. However, after baby #3 came along six months ago, I returned to work and quit about one month later. My other two girls are 4 and 3, and were only in daycare part-time. It was definitely too much, and unfortunately the expense of all three in daycare would have surpassed my salary, ha. Now, I’ve found enjoyment in being a SAHM, working out, and blogging! This is an incredible honor, and bravo for your bravery in telling us what it really looks like. We’ve placed impossible expectations on women to somehow work through pregnancy, birth, delivery, and breastfeeding, and it’s harming women, babies, AND work. In the research I’m doing with Startup Pregnant (thanks for the shoutout!) I’m finding out that it’s actually beneficial monetarily and psychologically for *everyone* to have paid leave (even the single guys and CEOs!). We’ve got a long way to go, and honesty about what’s happening is the most important first step. This was awesome, Lexi! I also loved Allyson Downey’s book and follow her work. Congratulations to you, and I miss you! Reading your post felt like catching up with you, mom to mom. Wishing you lots of sweet newborn snuggles when you new baby arrives!